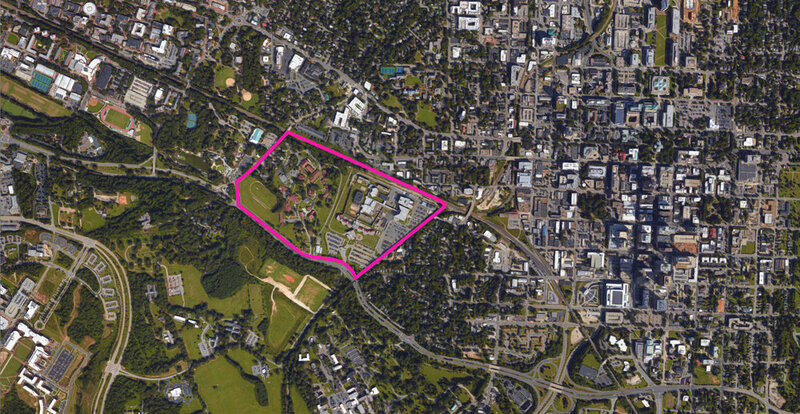 What if a DISCONNECTED 81.2 acres in the heart of Raleigh were transformed into multi-pronged opportunities for urban CONNECTION? This is the question we are asking architects and other designers to explore, investigate, dream, and debate in May 2018, in order to prompt a public discussion about issues of design and development in our city. CONNECTIONS is a design initiative to stimulate conversations crucial to the architectural success of Triangle Area. In recent years, Raleigh, Durham, and Chapel Hill have experienced explosive growth, a trend that promises to continue into the future. CONNECTIONS seeks to create conversations and visions centered around responsive design and development that considers place, context, and culture. We believe this will result in excellent architecture which plays an important role in any city’s identity. With all that is happening in Raleigh and the surrounding area, we feel it is important to have designer-led conversations about how to execute thoughtful, successful, and beautiful development. CONNECTIONS is an extended conversation, initiated by architects but involving the larger community of design experts, leaders, and users, that will produce actionable ideas and innovative approaches to issues in the Triangle. These ideas will be collaboratively produced in this CONNECTIONS event series. We worked with key leaders and invested organizations in the city to establish this premiere event, which will investigate a visible site and explore the explosive potential it holds. The premiere CONNECTIONS event centers around a design workshop that focuses on 81.2 downtown acres currently home to Central Prison and The Governor Morehead School for the Blind. Local architects, landscape architects, contractors, engineers, and developers will be asked to consider a hypothetical program that is partially prescribed, and partially left open to the designer's imaginations. Programming and design must take into consideration the historic legacy of the site while also looking towards an innovative, forward-thinking future. The event will kick off with an evening of Opening Lectures (open to the public) from five New York City planners, architects, and landscape architects responsible for monumental urban design projects across the globe. These talks will set the tone for the aspirational goals of the weekend. The speakers will also participate in a Design Workshop (open to design professionals), offering their expertise and experience to participants. The 3-day event concludes with an Ideas Presentation (open to the public) to celebrate the results of the Design Workshop. Every city has the need for a variety of services that benefit, assist, or protect it citizens. 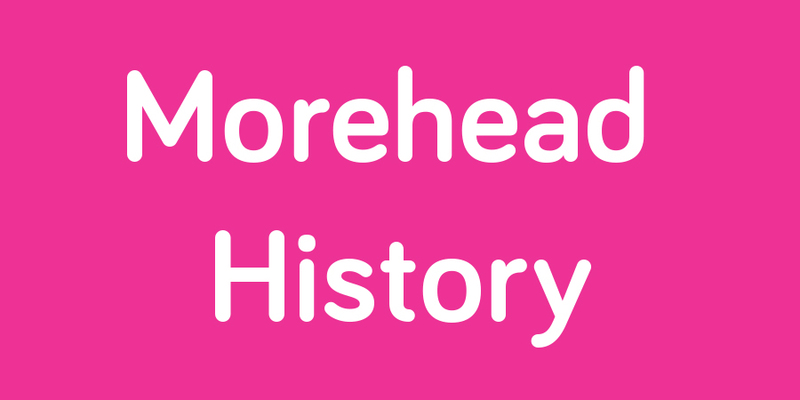 Raleigh's population increased 79% from 1900 to 1920 -- from 13,643 to 24,418 people!-- around the time that the Governor Morehead School was moved to its current site near the Central Prison, established in 1884. At the time, though these two institutions were important to the city's survival, they were located at the outskirts of the city. Raleigh’s population today is just under 500,000, and is projected to grow another 50 percent by 2030. 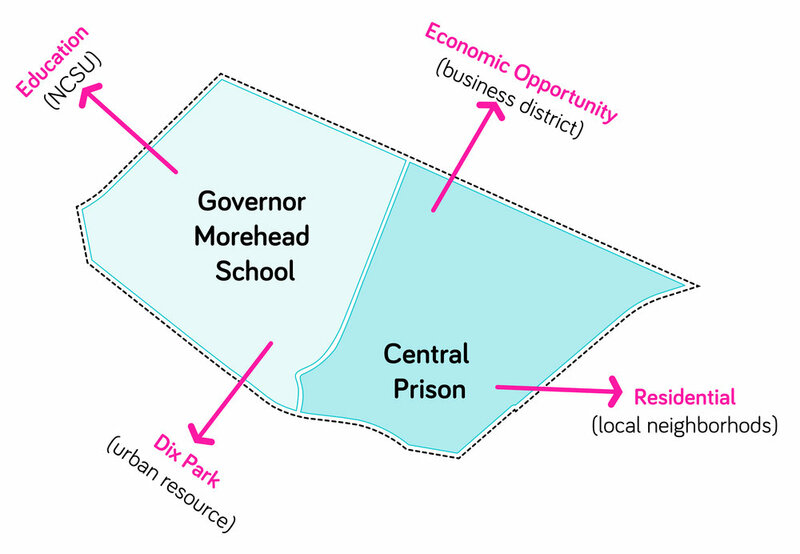 The Governor Morehead School and Central Prison are now at the heart of a growing city. Our proposal is to relook at their legacy, look at what they have offered the city since their establishment, and rethink ways that both these programs, as well as others added to the site, can benefit the present and expanding urban population. This project looks at the hypothetical removal of Central Prison from the 81.2 acres highlighted above. It looks at the hypothetical reabsorption and renovation of some of the Governor Morehead School buildings while incorporating this institution's fantastic work more holistically into the life of the city. However, in order to fully benefit from the the reconception of these programs, this project asks for its participants to design, strategize, innovate, and create new programs that can fill this 81.2 acres. What does our city need in this location especially in light of existing and future development surrounding it? What programs will take the legacy of these historic institutions and change, partner with, and enhance them to meet the area's growth, social ambitions, and design leadership goals? How can we use this 81.2 acres to be an example to other growing cities? This 81.2-acre site is perfectly located for eventual high-density, mixed-use development. It is truly a site surrounded by opportunity: Opportunity to connect to existing economic, academic, cultural, and residential areas; Opportunity to connect to a thriving downtown and the future Dix Park Development, already in design; and, Opportunity to show how North Carolina’s capital city can fully conceptualize and subsequently develop a community of excellence in residential, commercial, and landscape design. While this is a hypothetical project, some of the greatest design minds in and outside our State will come together for a 3-day event where together to dream big for this site. As a theoretical project, it is not currently bound by project schedule, politics, or budget. Instead, we are using this time to think uninhibitedly outside-the-box in order to allow participants to rethink the potential of this site at the heart of our city to focus on during our next event. What a design snowball of ever growing potential this can be! Exciting! How do I jump in?! This site is dedicated to the premiere CONNECTIONS event happening May 18-20, 2018. 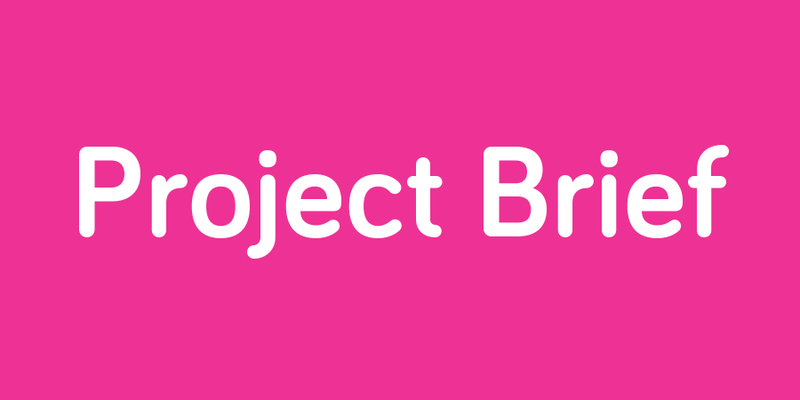 You will find the event schedule, as well as our project goals and partners/contributors. Please contact us if you have ideas or would like to participate. In order to facilitate a productive workshop with actionable outcomes, seats are limited. If you are not able to join us for the workshop, we do invite all to join during the opening lectures and the final ideas presentation. 1950: Raleigh's population of 65,679 makes it North Carolina's fifth largest city. Governor Morehead School (GMS) serves the special needs of visually impaired students in a unique residential setting. When the school was established in 1845, it was the eighth school for the blind in the United States. North Carolina was the first state to serve the African-American blind and deaf population, beginning just four years after the Civil War. GMS moved to its current location in 1923. The school provided services to children from birth to 21 years of age throughout the state. In the past decade, the school's role has expanded to serve school aged children in their home communities. Initiated in 1993, GMS's outreach program serves local education agencies across the state. These specialized services are provided in the child's local school system. GMS provides training for educators, has a fantastic Braille Music program, and is the only residential school for visually impaired students in the state. Central Prison in Raleigh has been in continuous service since 1884. It serves as the admission point into prison for adult male felons sentenced to 20 years or more, and is the main medical and mental health center for male inmates. It also houses special populations, including death row and safekeepers. While security requires that certain inmates remain in their cells, there are more than 260 inmate job assignments that include working in the kitchen, laundry or canteen. Inmates also work as barbers, janitors and clerks. Inmates can also attend substance abuse group therapy meetings, Bible studies or worship services.